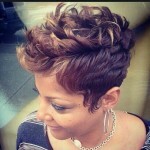 Looking for the hottest short haircut this summer? Here it is! 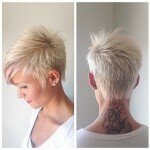 A new fresh short messy cut with side swept bangs from Jenna Elfman, this cut is the hottest short cut this summer! Jenna Elfman wore her hair tousled and with lots of texture. For the premiere of “Larry Crown”, Jenna Elfman has some major volume infused into her short messy cut. 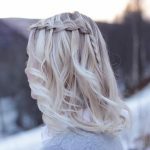 Jenna’s hair is blunt cut in layers, with the right side combed by way of her pretty light-colored eyes. The other side is feathered over her ears. By some sort of mysterious alchemy or plain old good skills in color matching, Jenna has somehow found earrings that match the color of her blond locks to a tee. She is wearing a plum silk dress with a flower detail on the right shoulder. Our eyes pop at her fluorescent yellow handbag and bronze pumps.